Is it important for couples to go to bed at the same time? What do you do if you are morning person and your spouse is a night owl? Who Deals with Getting Older Better? The instant reaction is that growing older is harder for women, but upon further examination, nearly all callers, women and men alike, believed that in general it is harder for men. 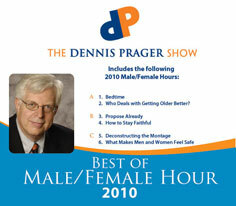 Dennis opened up the hour contending that it was equally hard for both sexes, but by the end, agreed with his callers. Dennis has a challenge to single men: why don’t you get married? He deals with objections, the usual and the unusual. Most men have to confront the temptation to stray sometime in their life. How does one resist this temptation? Dennis offers six compelling reasons not to stray or, to put it another way, how to stay faithful. Male callers weigh in with their own suggestions. Dennis with some help from Allen deconstructs the clips that making up the opening montage. Each one contains its own important male/female issue. Dennis talks to frequent guest, Alison Armstrong, renowned relationship expert and creator of the popular Celebrating Men, Satisfying Women seminars. Their topic is what makes men and women feel “safe?” They are totally different. And, as usual, men and women rarely have a clue of what the other is thinking.